Creator of famous art luminaries in the world, Baguès was born in Auvergne in 1840. In the 20s, Victor and Robert Baguès enlarge the collection of bronze fixtures of their father, and create their own iron models. 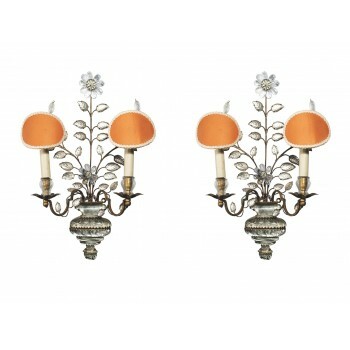 Maison Baguès, set of four sconces, Murano glass and gilded iron, circa 1950, France. Measures: Height 51 cm, width 34 cm, depth 13 cm.